A warm, spicy Mexican Tortilla Soup to be exact – perfect for driving that chill away. And with all my favorite ingredients too! And with a few chopped green onions, avocado, and a squeeze of fresh lime? SO good and SO full of flavor. And did I mention SO easy to make? That’s right – there’s very little prep for this one. One pot, a can opener, and a cutting board and you’re on your way to a super fast, healthy, AND yummy dinner. Which is EXACTLY what I wanted last night after my first week at my new job. I’m working a typical Monday thru Friday 8-5 job now, and will be for the next few months, so that doesn’t leave me a lot of time to cook. 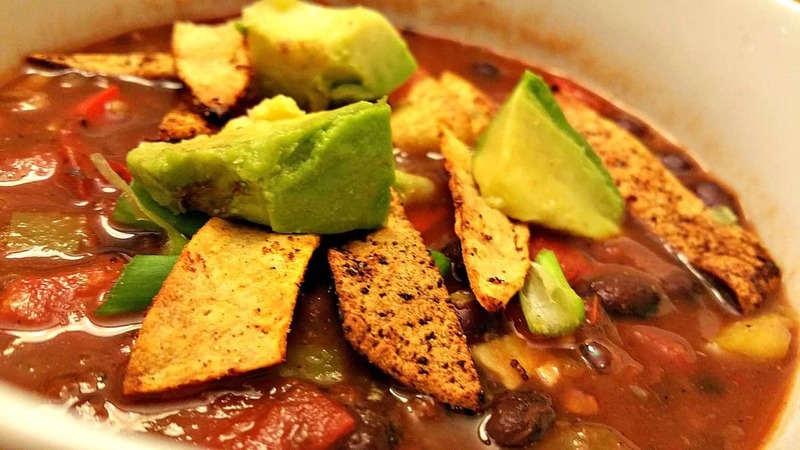 Which made this Spicy Mexican Tortilla Soup perfect for my short weekend. Chop up the white part of 1 leek, and about 3 large garlic cloves and add that to your soup pot with a splash of veggie broth to keep it from sticking. Saute until softened. Now chop one half of a Red Bell Pepper and one half of a Green Bell Pepper and add that to your pot giving everything a good stir. Let that simmer until the veggies have softened. Note: You could also use a small Red Onion in place of the Leek – I can’t use Onions because it triggers my daughter’s tummy issues. Finely chop up 2 Chipotle Peppers with their Adobo Sauce and add that to the pot. And finally let’s add some spice – 1/2 tsp Cumin, 1/2 tsp Mexican Oregano, 1/2 tsp Chile Powder, 1/2 tsp Paprika, and a good pinch of salt and pepper. Stir those into the pot and let that simmer for a minute to allow the spices to release all their wonderful flavor and aroma. Note: Mexican Oregano can be found in the ethnic section of your grocery store next to the salsa, corn husks, masa flour, etc. Look for it where they display their spices and bags of dried chiles. It’s pretty course so I measured out 1/2 tsp and then ground it up with my fingers. Now add 1 cup of your favorite Salsa. It can be homemade, store-bought, whatever you prefer. I went with my old standby Pace Chunky Salsa – Medium Heat. It’s fat-free and has less sodium than their Picante Sauce. Add 2 15oz cans of Fire Roasted Tomatoes. You can use any diced tomato, but I really like the flavor of the Fire Roasted. Now add 2 cups of your favorite low-sodium Veggie Broth. Let that come to a simmer and add 2 cans of Low Sodium Black Beans. I drained them but did not rinse as I wanted a little bit of sodium in the soup. If you’re really watching your salt intake – rinse them first before adding and then add salt to taste. Let that come to a boil and turn down the heat to simmer for 15 minutes or so. Done. See? How easy was that? Slice up some Avocado, Green Onions, and Cilantro to allow your family to add whatever garnish they like. Be sure and slice a fresh Lime or two – it really adds to the flavor. The Tortilla Strips were regular Corn Tortillas I sliced into strips. After slicing, I put them in a bag and added a teaspoon or so of veggie broth with some spices and shook them up. This is completely optional of course but adds a bit of spice to otherwise plain corn tortillas. I used 1.2 tsp each of Garlic Powder, Garlic Salt, Onion Powder, Chile Powder, and Cumin. Bake them at 375 degrees on a cooke sheet for about 8-10 minutes. Toss them around a bit during baking to ensure even crisping. Enjoy and we’ll see you next weekend! A warm spicy Mexican Tortilla Soup perfect for driving the cold winter chill away. One pot and only a few ingredients makes this a fast, healthy meal. Chop leek and mince garlic and add to large soup pot. Saute in a little veggie broth until softened. Add Bell Peppers and Chipotle Peppers and simmer until softened. Simmer 15-20 minutes ir until heated through. Toss occasionally to ensure even crisping. I just made this soup…it was beyond delicious! Loved it! Added some corn, too.